(TibetanReview.net, Nov03, 2016) – Mr Shanta Kumar, a member of parliament belonging to India’s ruling BJP, has on Nov 1 called on New Delhi to honour Tibet’s exiled spiritual leader, the Dalai Lama, with the nation’s highest civilian Honour, the Bharat Ratna, in recognition of his great service to humanity. 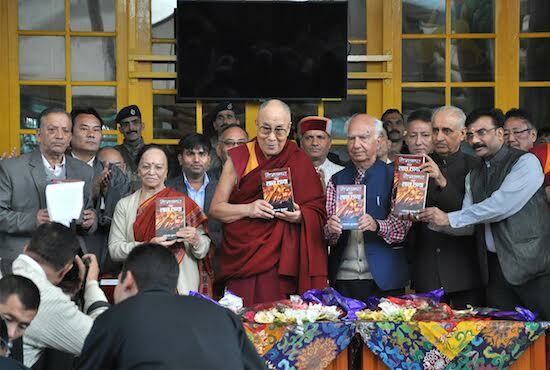 The occasion was a public function at Dharamshala during which the Tibetan leader released three books. One of the books was a reprint of “Himalaya Par Lal Chhaya” (ie, Red Shadow Over the Himalayas), written by Mr Shanta Kumar, a former Chief Minister of Himachal Pradesh as well as a former central government minister, in the aftermath of the 1962 India-China war. “After 50 years of the launch of the book, a threat is again looming large on the borders as China is building massive infrastructure and of late has been showing aggressiveness against India,” the IANS news service Nov 1 quoted Kumar as saying. The Dalai Lama has often described himself as a “son of India”, having lived in the country since his escape in 1959 after the Chinese invasion of his country and almost all of it at Dharamshala, Himachal Pradesh. Indeed, the Dalai Lama has said at the function that he was feeling like a citizen of this state, where he had lived for more than 55 years.